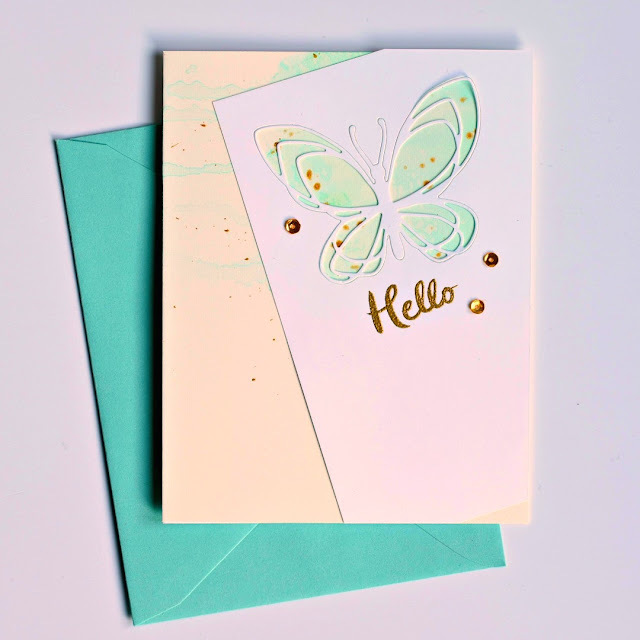 My original plan was to place the beautiful Concord & 9th Floral & Flutter butterfly right on the watercolored portion of the card. However, when I used the white panel with the die cut space to help me figure out where to place the butterfly, I decided to keep the panel -- trimming it as shown. Gold embossed the sentiment from Essentials by Ellen Hello Gorgeous, speckled some gold acrylic paint, and adhered a few sequins. This card is for the Ellen Hutson January Mix It Up Challenge. The requirement is to use anything from Concord & 9th and the Essentials by Ellen line. Done! Happy accident indeed, it looks great! I love those angled layouts. Wishing you good health for this year, and as few complications (preferably none) as possible! Beautiful. Some the simplicity yet a lot of interest for the eye. Nice work! So pretty! Turned out fabulous! You ended up with a better design and a very creative one at that! Pretty watercolor background and so nicely coordinated with the envelope. I hope your weather warms up soon. Been watching it on the news. Brrrr!